Labor of Love - The Resident Community News Group, Inc. | The Resident Community News Group, Inc.
For many of us, Labor Day offers one more marvelous chance to squeeze in another summer trip filled with fun and adventure. “A great activity is to ride bikes with your kids to St. Marks and back on the rails to trails pathway. Then too, we saw all kinds of wildlife on the little hiking trails, and in the narrated glass bottom boat tour.” exclaimed Moseley. 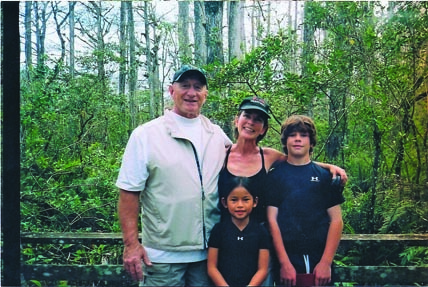 Robin and Tom Virtue and their two children, Grant age 17 and Kara age 15 found Hammock Beach Resort in Palm Coast offers something for everyone. Avondale couple Jaime and Sonya Hoener love heading up the road to Charleston. Sonya Hoener said, “Charleston is filled with lots of fun, little places to stay. Both the Francis Marion and Mill House are wonderful; even the Hampton Inn is historic. It’s easy to walk around to visit the shops, art galleries and historic sites. We love looking at the great old homes on the Battery. The food is phenomenal!” Favorite restaurants include Slightly North of Broad, Hominy Grill and Fleet Landing, a great outdoor seafood restaurant. Avondale resident Cheryl Sapora recommends Winter Park “where shopping is an Olympic sport”. She suggests taking the train to Winter Park as a fun, stress-free way to travel. Another fun and relaxing activity is the one-hour boat tour of the lakes offered by Scenic Boat Tour. (www.scenicboattours.com.) Afterwards, enjoy lunch at Cheryl’s favorite restaurant, the Briarpatch. Whether you love nature, shopping or history, there’s plenty to do just a short drive away. Pack your bags and get ready to recharge your batteries with one more summer fling this Labor Day!